Haochen debuts with the Tokyo Metropolitan Symphony Orchestra led by Maestro Kazushi Ono this Monday playing the beloved Rachmaninoff third piano concerto. He will also be joining the Suntory Chamber Music Festival in Tokyo later this month on September 16. More information here. Haochen returns to the Santa Fe Chamber Music Festival this early August for four performances within four short days. His final performance with the festival culminates with Bach's 5th Keyboard Concerto on August 5. Just a few days later, Haochen continues chamber concerts across the country in Maine at the Bay Chamber Concerts August 10 and 11, joining violinist Benjamin Beilman. As a 2017 recipient of the Avery Fisher Career Grant, Haochen was honored to be featured by WNET's NYC Arts program discussing his thoughts on music. You can watch the video here. Peter Dobrin commends Haochen's performances at the Rachmaninoff Festival in Philadelphia this past weekend, writing "The Curtis-trained Zhang had the harder assignment with the two more rare concertos, the first and fourth, and he proved a pianist with an ear for introspection and a range of colors. In the fourth concerto, which is less emotionally direct than the other concertos, Zhang ventured some dramatically convincing opinions." To read the full Philadelphia Inquirer article, click here. 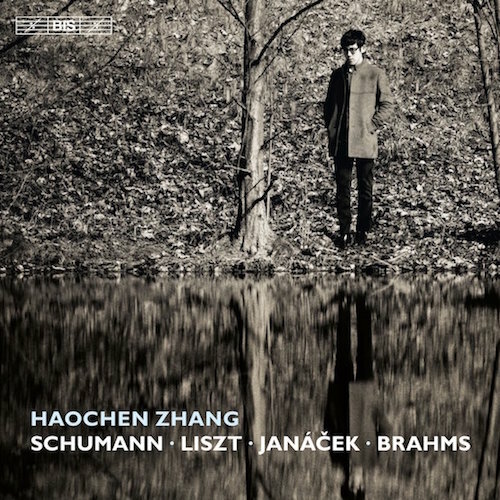 Rating the album four stars, The Guardian, writes "Haochen Zhang is both a prodigiously award-winning pianist and a self-confessed introvert, and the wide-ranging choice of repertoire on his first studio disc reflects this. He captures the childish, quickly dissipating seriousness of Schumann’s Kinderszenen, and plays it with the kind of artistry that sounds sincerely artless. Liszt’s Ballade No 2 has Zhang creating great rumbling waves in the left hand, then closing in an atmosphere of hard-won peace. In this, and in Janáček’s Sonata 1 X 1905, he excels in conveying the larger shape of the piece, knitting the phrases together into long paragraphs, yet he doesn’t short-change the showier passages. Brahms’s Three Intermezzos, Op 117, make for an understated close to an intimate, inward-looking disc, and their feeling of slow rise and fall evokes the breathing of a huge creature asleep. Rarely on this recording does his playing make a forceful bid for the attention, but it certainly rewards close listening." See the review on The Guardian's site here. The German online classical magazine, Klassik Heute, gives Haochen's new BIS album 9/10 stars!